Mawan (right) recieving a PBB Batik uniform from PBB president Datuk Patinggi Abang Johari Tun Openg (centre) in front of (from left) Nanta, two deputy presidents Datuk Amar Douglas Uggah Embas and Datuk AmarAwang Tengah Ali Hassan. Picture dated Nov 3, 2018. 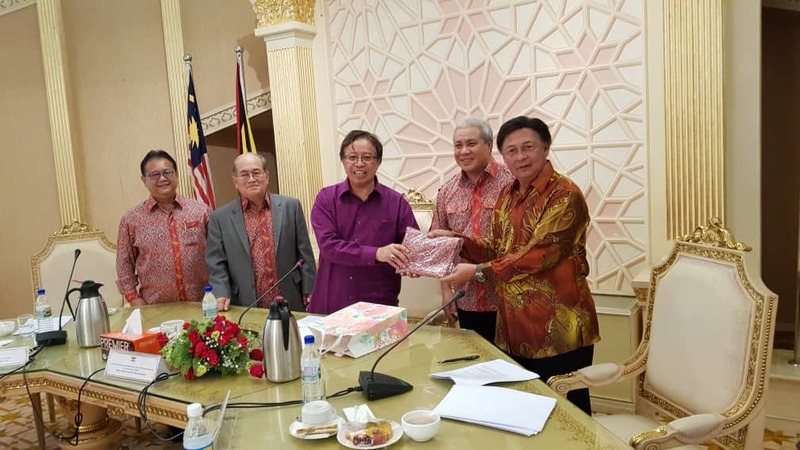 KUCHING: Parti Pesaka Bumiputera Bersatu (PBB) has officially appointed Pakan assemblyman Tan Sri William Mawan Ikom as its supreme council ex officio member. Its secretary general Datuk Alexander Nanta Linggi said since Mawan is an elected representative, he is appointed into the PBB as a supreme council member. Mawan has been a PBB member when he was issued a membership card (no. 470000) during former Chief Minister, the late Pehin Sri Adenan Satem’s time back in 2016. Nanta said PBB has to respect Adenan’s wish for Mawan to be in the party fold. Mawan (second left) presenting membership application form to Adenan (seated) while other appliicants and top party leaders witness. Photo from 2016. The official acceptance was made on Nov 3 this year at PBB supreme council meeting where Mawan attended it for the first time in his capacity as ex officio committee member. Nanta said Mawan is now free to move around in Pakan as a PBB senior leader. However, he could not say much about which party in Gabungan Parti Sarawak (GPS) would be holding the state constituency of Pakan now because it is too early to talk about it. Mawan won the Pakan seat in May 2016 state election via the Barisan Nasional (BN) direct candidate ticket after he quit Parti Tenaga Rakyat Sarawak (Teras) in which he was the former president. The BN direct candidacy was the Sarawak BN solution for candidates who were not part of the BN registered components. Mawan joined Teras in 2015 after a fallout with the then Sarawak Progressive Democratic Party (SPDP) leaders because of some fundamental political differences at the material time. Mawan (right) recieving a PBB Batik uniform from PBB president Datuk Patinggi Abang Johari Tun Openg (centre) in front of (from left) Nanta, two deputy presidents Datuk Amar Douglas Uggah Embas and Datuk AmarAwang Tengah Ali Hassan. 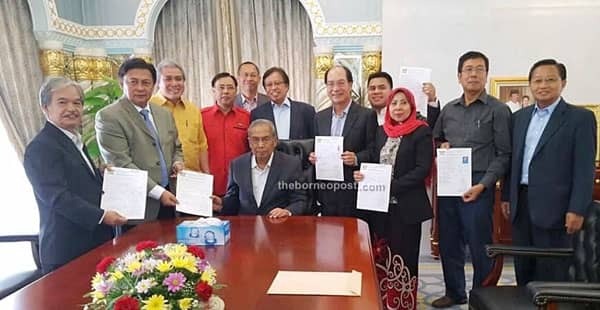 Mawan (second left) presenting membership application form to Adenan (seated) while other appliicants and top party leaders witness.